One technology that has been proven to deliver amazing results is the Dermapen Micro Skin Needling. The treatment is a form of collagen induction therapy where a series of needles penetrate the skin causing thousands of micro injuries at a vertical angle using a specialist medical device, for both faster and more precise needle penetration. The procedure leads to increased collagen production, which effectively repairs scars, reduces discolouration and renews tired looking skin. The Dermapen has revolutionised micro skin needling, making it easier, safer and less painful to get maximum results comparing with tradition Derma Roller skin needling. The results are more extraordinary, longer lasting and treatment time is faster, making this a top choice for anyone looking to achieve younger, smoother skin. What skin conditions can be treated by Dermapen? Dermapen for skin rejuvenation will give you great results to include wrinkle reduction, tightening of the skin, reduce sun damage, improvement in skin tone, reduction of large facial pores and a general vibrant look. 4-6 treatments are required at an interval of 4 weeks apart. Dermapen™ for stretch marks can treat nearly all parts of the body including stomach, legs and the breasts. The treatment time depends on the size of the stretchmark and can take up to 90 minutes for a large area such removing pregnancy related stretch marks. Up to 10 treatments are recurred at an interval of 4-6 weeks apart. 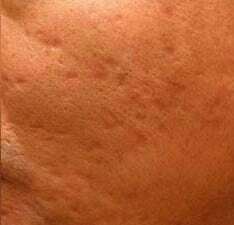 Dermapen™ for acne scarring can achieve almost similar results as any ablative treatments such as fractional laser, IPL, laser resurfacing and chemical peels, without the negative side effects and downtime.6 treatments are required at an interval of 6 weeks apart. The DermapenTM Skin Needling System has been proven to stimulate collagen production, enhancing the skins ability to repair itself in areas that may not be looking their best. The procedure takes the concept of micro needling to a new level, by delivering multiple, vertical needles rapidly to a localised area of the skin. The treatment itself involves your dermal practitioner moving the device around the area of skin to be treated. For facial treatments, each session usually takes around 20 minutes, or up to 90 minutes for treatments on the large body area. All you need to do is sit back and relax. This proven technology can reduce scarring, treat stretch marks, tackle acne scars and can even reduce wrinkles. After just one session, you’ll be left with a smoother, younger and healthier looking skin, and with no down time following treatment you’ll be able to get on with your day straight away. 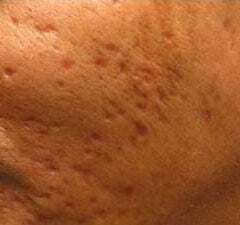 DOES DERMAPEN MICRO NEEDLING HURT? You might think that having a bunch of tiny needles stamped into your skin would be painful, but surprisingly it is not. Before treatment you’ll have a topical anaesthetic applied, which will eliminate any discomfort during the process. Everyone who has experienced treatment with the Dermapen has remarked on how pain free it really is, and some have even commented that it’s a little like a rather rough massage. Yes, the treatment is completely safe. The micro needling treatment does not pierce the skins natural barrier, only penetrating into the epidermis to stimulate collagen production. The epidermis heals rapidly, usually in a matter of hours, and the skin should be completely back to normal within 24 to 48 hours. You will begin to see the results immediately after the treatment, however the results will improved in the weeks following.